IOS App Developer: Dorna Sports S.L. 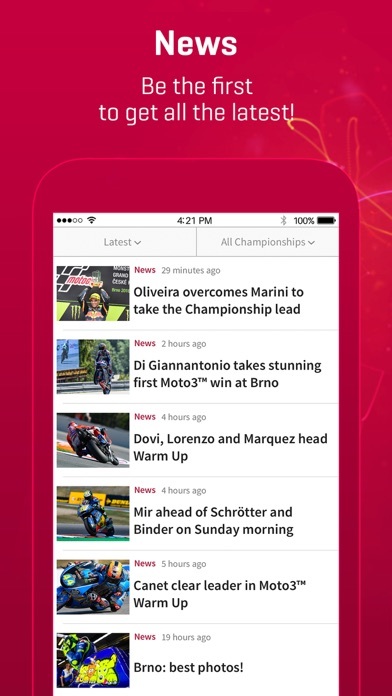 Wherever you are, get the brand new Official MotoGP™ App now and enjoy the best all-inclusive tool for following the World Championship in detail. 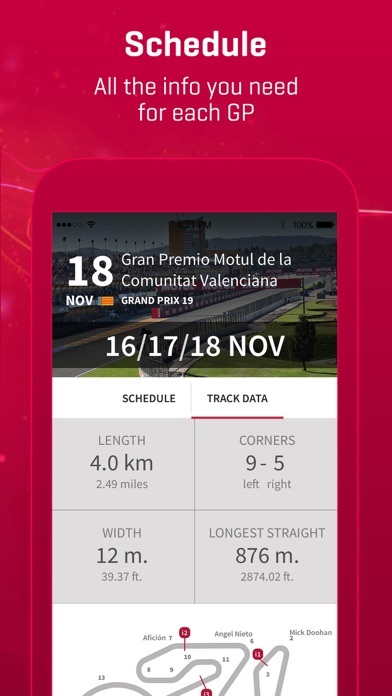 The Official MotoGP™ Application is the only official app which provides a spectacular range of features to help you follow your favorite sport, such as Live Video multicameras in HD, Live Timing & 3D Tracking and Audio Commentary of each practice, qualifying session and race during the MotoGP™ World Championship – all available in real-time and on demand via your smartphone or tablet. On top of that you can get all the latest news and photos directly from the paddock, the calendar and timetables, results, exclusive rider info and statistics from every Grand Prix. • AVAILABLE IN ENGLISH, FRENCH, GERMAN, ITALIAN, SPANISH & JAPANESE. 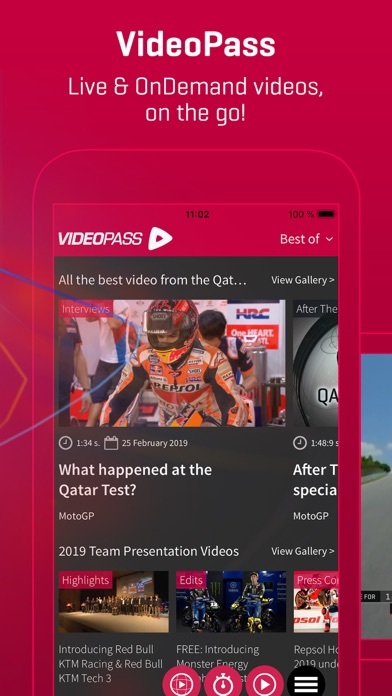 Key features include: • Live & OnDemand VideoWatch all Grands Prix Live and OnDemand in High-Definition, as well as exclusive content and the best moments of every session - from every race. Enjoy more than 45,000 videos from 1992 to the present day including full races, interviews, summaries, features, reports and much more.Pick your favorite layout and watch up to 4 of the 6 available feeds simultaneously! You can also pause or rewind the action via DVR feature. • Live TimingFollow the action as it unfolds with the extensively updated Live Timing feature, and watch lap times progress as the riders speed through each sector of the track. Weather info, split times, sector tracking and exclusive data allows you to see exactly how the riders are performing throughout each lap and chart the riders as their teams and mechanics do. All available Live & OnDemand.• Real-time 3D-Tracking Follow any rider in real-time around the track - zoom in on the action on the enhanced and interactive circuit maps to follow a specific rider or pull out for a wider perspective to see the whole field. Change angles and perspectives as you wish during sessions and races. 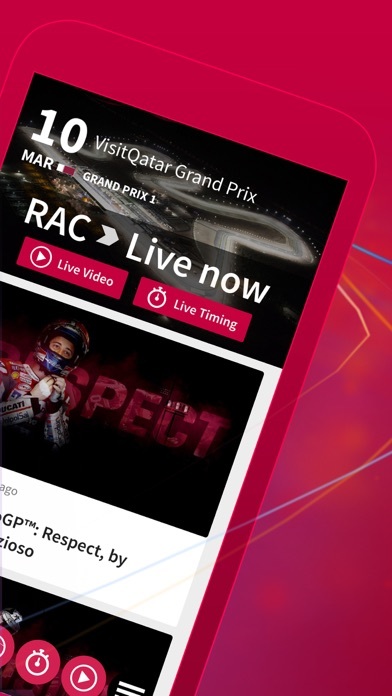 All available Live & OnDemand.• Live Audio CommentaryFollow all the sessions of every Grand Prix with the Audio Commentary from the motogp.com commentary team. All available Live & OnDemand. • Latest News & PhotosBe the first to get all the latest preseason news, plus updates during race weekends and between Grands Prix throughout the season - including more than 200 new photos per Grand Prix. • Inside MotoGP™The MotoGP™ guide has been significantly enhanced to feature everything you could possibly need to know about the world of MotoGP™, including technical info on the bikes, a detailed history of the sport and enough info on all the rules & regulations to satisfy any huge fan of the sport! • Events InfoGet all the information you need for each circuit, including key data, racing stats and records, videos, directions and much more. • Riders and TeamsCheck out all the stats, pictures and information about the riders and teams of the MotoGP™ World Championship, updated prior the start of the season! App was designed NOT to work... App will load black screen - hang / freeze - not respond. BROKEN. When I do get the app to play - will reset every 5mins - freeze. Forcing me to start race from beginning. YOU CAN NOT WATCH A RACE LIKE THAT!!! App was designed to NOT WORK!! I subscribed to live timing and live video to use while attending a MotoGP event. The app froze and kept telling me they are having issues and to try again. I was unable to use either service during the whole race. Major disappointment!! The app has great coverage when it works, they need to get their servers figured out. Have used this app and paid my subscription to watch my favourite sport for years and loved it. No issues ever. Different story this year. Constant pixelation and buffering make it almost impossible to watch. Very frustrating. Dear friends, did you get charged an annual subscription of 17.99 € on Nov-2018 for TimingPass which is supposed to be good through 19-11-2019? Is your timing option grayed out like mine? Have you logged out/in, rebooted your device, restored purchases, deleted/reinstalled the app and even sent an email to MotoGP support only to be met with silence? Me too. This is bordering on fraud. Dear Donna Sports, I hope you read these reviews. The latest version of your app is a big disappointment. When I watch a video and it completes, it do not want to watch whatever video you think I might want to watch next. I just want to go back to the home screen and find the video I want. Unfortunately your app turns something that simple into an ordeal. When my video ends, it appears my only options are to let you load your choice of videos or to replay the video I just watched, neither of which is my preferred choice. But, to get back to the home screen I must wait for one of those things to occur so that I finally have an option that I want, to exit the video player. Even then, it isn’t so simple because that just dumps me back to the video title/description screen. From there I must push another back button to finally get back home. To make things even more frustrating, the back button is located on the lower right whereas the video player exit back button is on the upper left. Poor UI design if you ask me. Are you admins not checking this app??? I get an aggravating pop up that's unavoidable. It's saying to update my profile. Then when I update my profile it says it can't save it. Then it pops up again and again and again. FIX IT!!!!!!! $157 and a New iPhone 8. This app won’t let me even see what’s available...it continually wants me to update my profile...then it says that it cannot update my profile...then back and forth. Absolutely embarrassing. Shameful really. It’s awesome to have MotoGP on the ATV. The log in was super easy via my iPhone. Adding No Spoiler mode and multiple camera views like the iPad app would make this a 5 star app. App looks nice - slick UI. But, very glitchy - gets stuck in the video loop with no way to return to the main menu. Would be one star based solely on UX, but UI and content salvages a little. Progressive streaming isn’t SOA either. Overall, disappointing and does not do justice for the high value content. 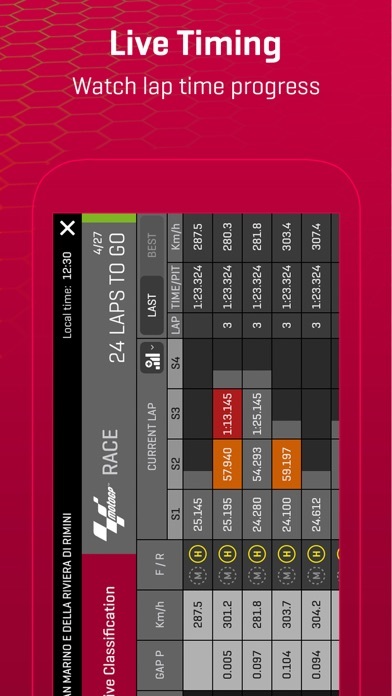 More IOS Apps by Dorna Sports S.L.